Sharing a folder via SMB (the so called Windows Sharing) with OS X is easy. But username and password were always required. I wanted to make an anonymous share and didn't know how. One can see the Everyone user added and still a password was required to log in. Accidentally I found the fix for that. 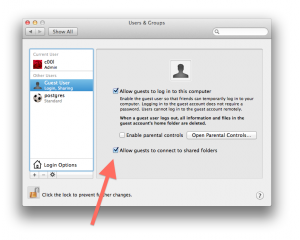 NOTE: The guest user is disabled by default in OS X Lion. You'll have to enable it first. No, this does not seem to resolve the issue. Windows still says "Logon failure: unknown user name or bad password". This is the only content on the web I can found that address this issue. Do you have to use the username "guest"? Are there any steps missing? Well here and here seem to suggest what you write here is not possible. The common solution seems to be to create a new user just for samba sharing or disabling the default samba and reinstalling it from source. If this comment is true, then what's available through Sys. Pref is a "home grown" Apple version of samba, which explains why installing Samba 3 works. This is just too much work to do something as simple as anonymously share files with Windows. All in all, what's written here doesn't seem to coincide with the reset of the internet literature. It definitely works with other apple machines, it maybe work with some flavors of linux and older versions of windows, but for me following your instructions fails on Windows 7. I appreciate the post and the reply, just hoping to help anyone else who run into trouble. The first post is not reliable - the guy simply not able to set it up. The second seems more serious. I'm thinking of making a more elaborate test to test that. Sorry, both posts were from me. One was just really late at night and was frustrated things weren't working. The issue is with this panel in the options, you need to select a user for SMB sharing. 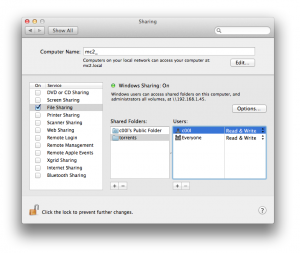 It's terrible that OSX makes it difficult to share your public folder with Windows. And Windows was being a pain because any folder with an ampersand was being renamed with an underscore, resulting in an error when accessing. Both OS's need to get their act together and make network sharing simple. It doesn't work even with this option, which was ON on my machine. This is very frustrating. Now it doesn't work. Will try to fix it later. 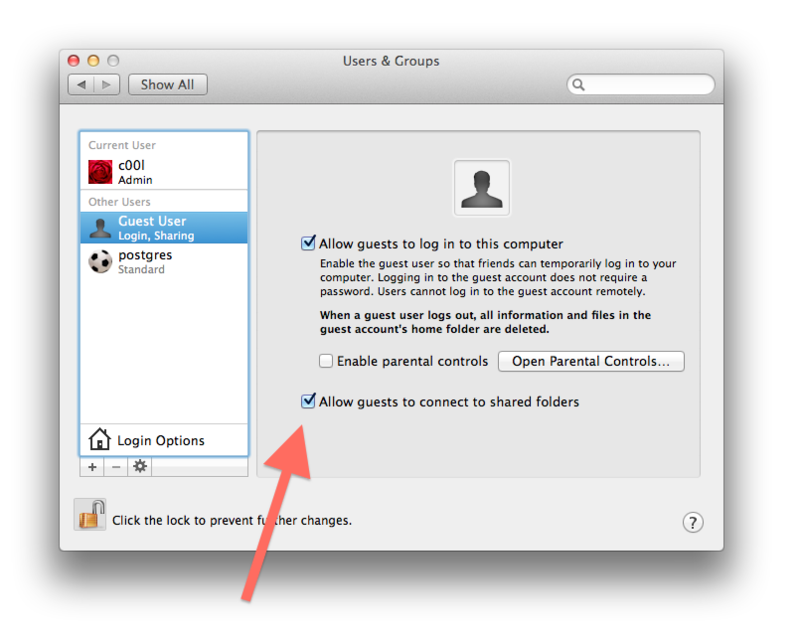 For those who are interested, you still need to use "Guest" as the user name without a password in order for this to work. Yes this is the final piece of the puzzle thanks. Works great. I could not get any password to work on my Macbook Air. I am now able to share the files on the network.